I love putting them in everyday life and giving them a little glamour. 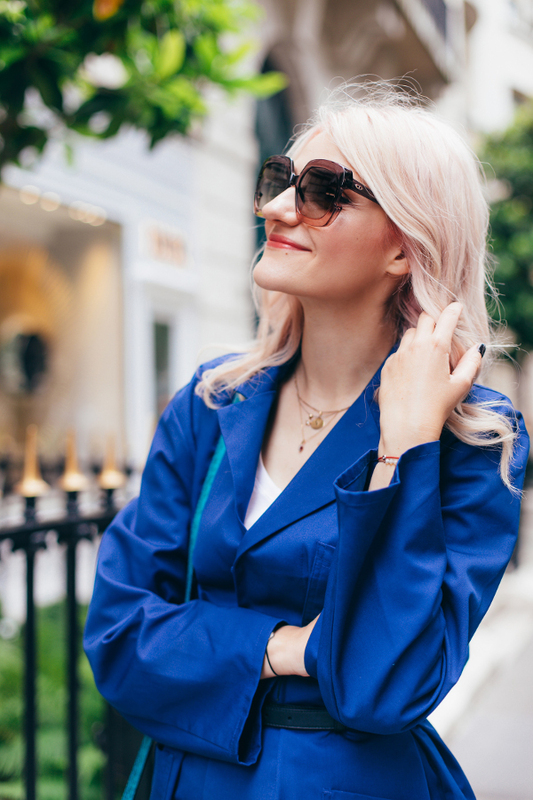 After I posting a pic from Paris, a lot of people asked me about the nice blue trench. Here is how, in a particular combination, we can go beyond function, emphasize the shape and achieve a super chic effect – with work uniforms. For that purpose, I added some accessories: a fine belt, big sunnies, and my favorite sling-back summer shoes. By the way, did you notice, in this seemingly endless variety of clothes that over-floods us, our real choice is really extremely limited. What is being offered is often ultra-mass, all the same, boring, and too predictable. If we think beyond the trends, we can often see the potential in things that are, at first sight, too simple and ordinary. With the right idea (and some accessories), we can achieve elegance that is fresh and effortless. And what about you, dears, would you dress that way?